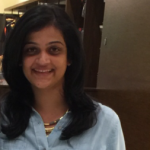 Unlike people with oily and combination skin types, people with dry skin are always traipsing through hundreds of brands to look for that perfect body lotion that they can use throughout the year and not just in winters. Their skin is always flaky, bumpy, and sometimes,simply painful – even if it is just one day that they forget to apply a body lotion. Don’t worry, I’m here to help you find that perfect body lotion. And, this time around, I will prove that you don’t need to break your head or your bank to invest in the best one. 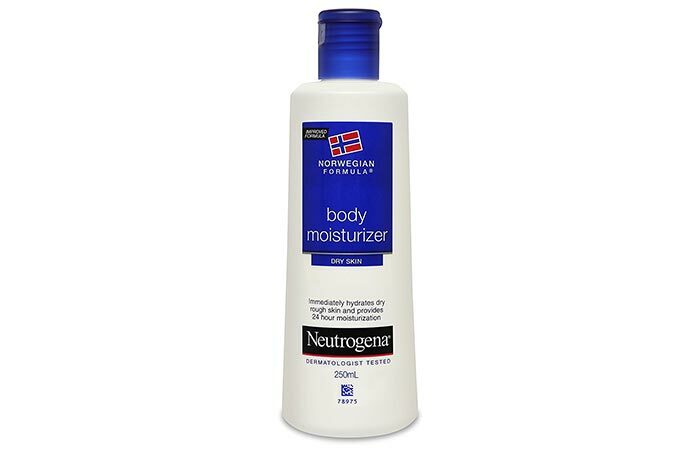 Below are 10 best drugstore moisturizers for dry skin that are simply amazing. 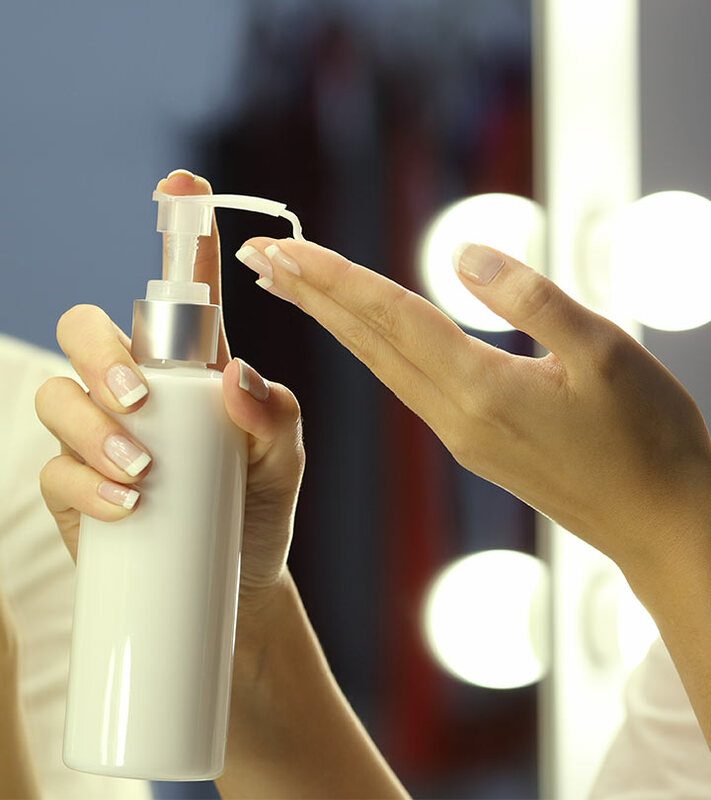 What Should You Look for in a Drugstore Moisturizer for Dry Skin? Whatever it is that you decide to buy – drugstore or expensive brands – use body creams/lotions that have natural hydrating and moisturizing properties. Here are some common ingredients that moisturizers should contain. Essential oils like jojoba, primrose, etc. Vitamins A, E, and D.
Coconut, almond, castor or avocado oil. Neutrogena is not new to any of us, and is one of the most trusted cosmetic brands. The Norwegian Formula is specially formulated for dry skin. It is thick and creamy but easily penetrates through your skin. It has a faint fragrance that lingers for a long time. It also makes your skin supple for the whole day. It can double up as an excellent hand cream too, for some people have extremely dry hands. Contains glycerin and is thus non-greasy. Long lasting and works great on dry skin. Can feel greasy on normal skin. Nivea moisturizers are bestsellers, and they have one for every skin type. 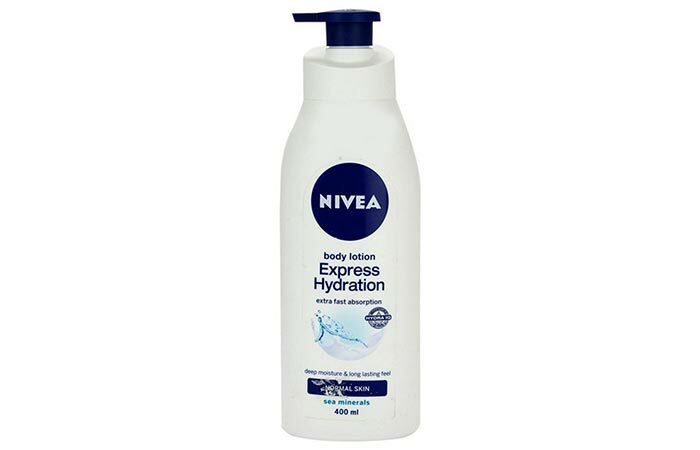 The Nivea Express Hydration Body Lotion the best drugstore lotion for dry skin. The texture is so smooth and non-greasy that people with normal skin type can also use this without feeling gummy. It contains sea minerals and Hydra IQ that seep deep into the layers of your skin and leave it smooth, hydrated, and healthy all day long. It is perfect for humid and hot weather conditions too. Improves overall health of your skin. 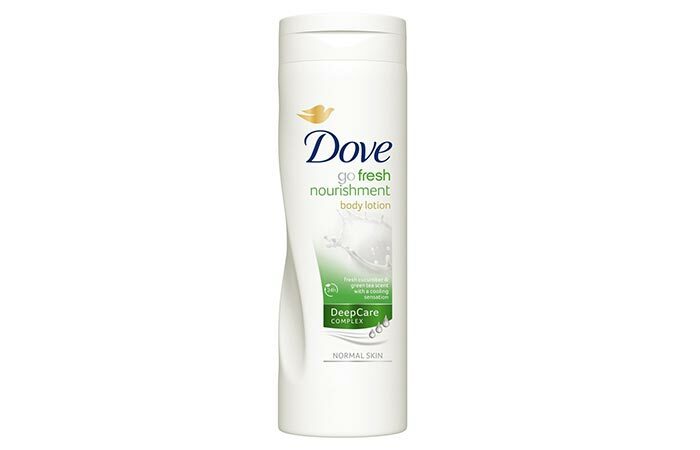 Dove Fresh Nourishment Body Lotion is a combination of natural ingredients like sunflower seed oil, amino acids, and glycerol that repair your skin and nourish it so that it retains its elasticity.Plus, it keeps the skin hydrated. Cucumber is known for its hydration properties while tea tree oil leaves a soothing effect on your skin. This lotion is made with patented skin nutrient technology that helps replenish moisture levels almost immediately and leaves you hydrated all day. Leaves a cool tinge on the skin. Needs to be reapplied for extremely dry skin. 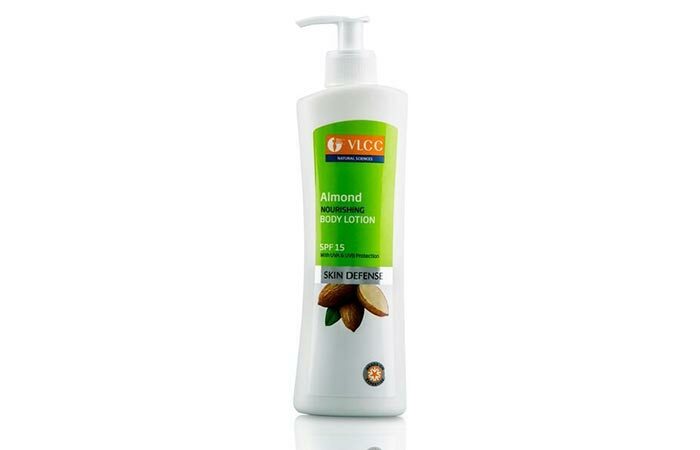 VLCC Almond Nourishing Moisturizing Lotion has all things your skin needs for nourishment and keeping you hydrated, supple, and soft all day. Enriched with almond oil, aloe vera, wheat germ, and fenugreek, this lotion nourishes your skin from deep within. It is loaded with SPF 15 not just to protect you from premature aging, but also to repair damage from the sun and any skin darkening issues from dryness. Has a slight herbal smell. 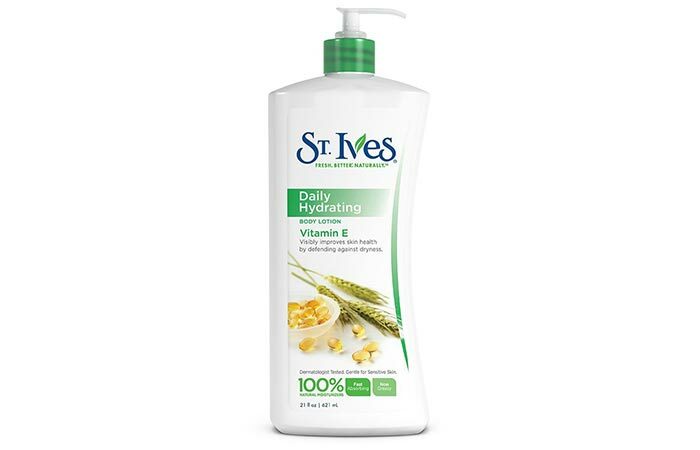 St.Ives is a drugstore brand but delivers no less than any other premium body lotion with fancy ingredients. This body lotion contains Vitamin E, which is known for deep conditioning and healing skin, and avocado, which is an excellent moisturizer. It has plant-based glycerin and is free of any parabens. Lotus Herbals is an excellent choice of brand if you are looking for cruelty-free and natural products. This AlphamoistHydroxy Skin Renewal Moisturizer contains grape extract, which is a natural astringent. Plus,it’s anti-bacterial, which soothes any irritation caused due to dry skin. The milk enzymes nourish and rejuvenate your skin while aloe vera moisturizes, soothes, and heals your skin from deep within. It works as an antioxidant and is antibacterial. Softens and soothes your skin. 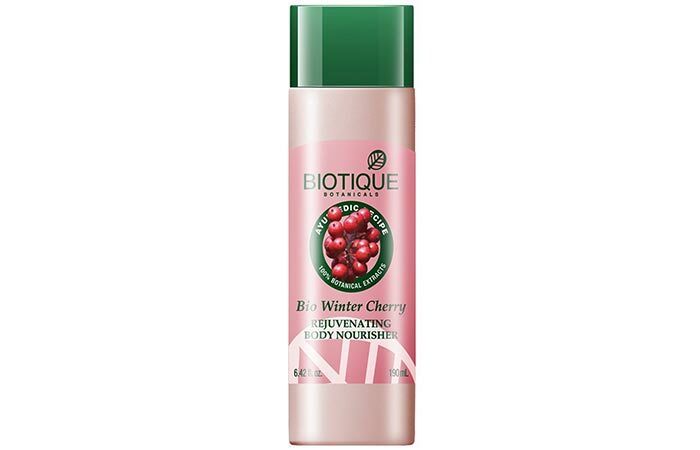 The Winter Cherry Rejuvenating Body Lotion from Biotique is loaded with oils that are enlisted as some of the best for skin replenishment in Ayurveda. Surajmukhi tail (Helianthus annuus oil), Kusumbhi tail (Carthamustinctorius oil), Sarson tail (Brassica nigra oil), Badam tail (Prunusamygdalus oil), Jatamansi (Nardostachysjatamansi), and Ashwagandha (Withaniasomnifera) revitalize your skin and nourish it like no other. The lotion is, however, thicker than your usual creams and has a strong smell because of the herbs – but it works wonders on your skin. It stays on your skin for more than 12 hours. Lightens and improves the skin texture. Some may not like the herbal smell it has. Shea and cocoa, like we all know, are natural butters that are loaded with nutrients that take care of all your skin needs like moisturization, nourishment, and hydration. It is dermatologist certified.It’s non-greasy and leaves a faint fragrance on your skin. Smells great and keeps your skin hydrated for the whole day. Developed, tested, and recommended by dermatologists. 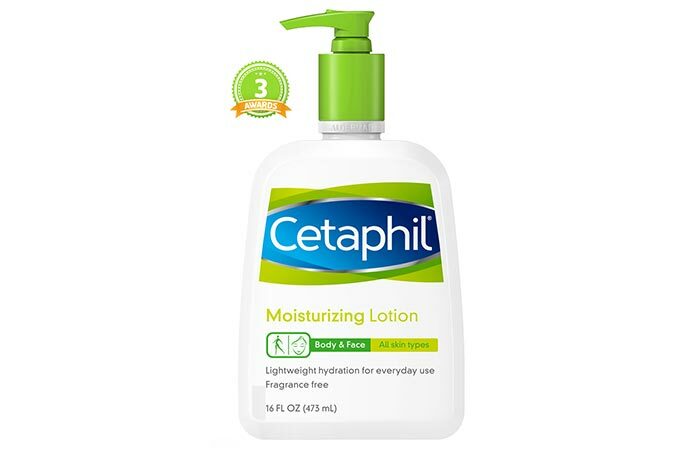 Cetaphil Moisturizers are dermatologist recommended, even for kids who suffer from extreme skin issues – that’s how safe and effective this lotion is. It heals cracks, patches, bumps,andchronically dry skin. It is light, smooth,and intensely moisturizing. It helps lock water in the skin and also prevents moisture loss. Plus, it can be used on your face too. Works even on sensitive skin. Provides instant relief from redness and dry or scaly skin texture. 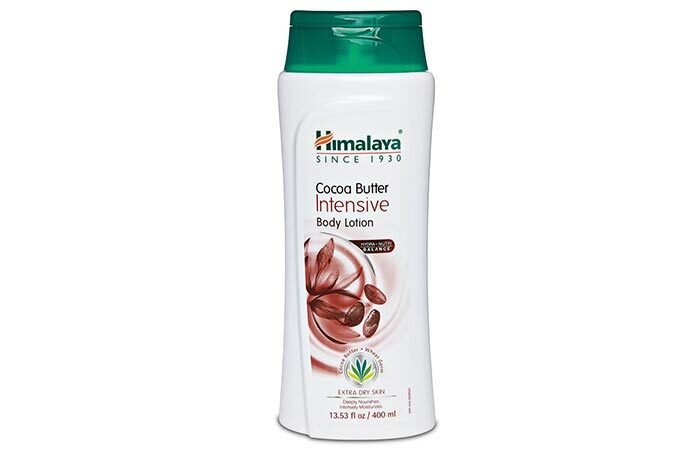 Himalaya Herbals Intensive Cocoa Butter is one of the brand’s bestsellers in the moisturizing segment. 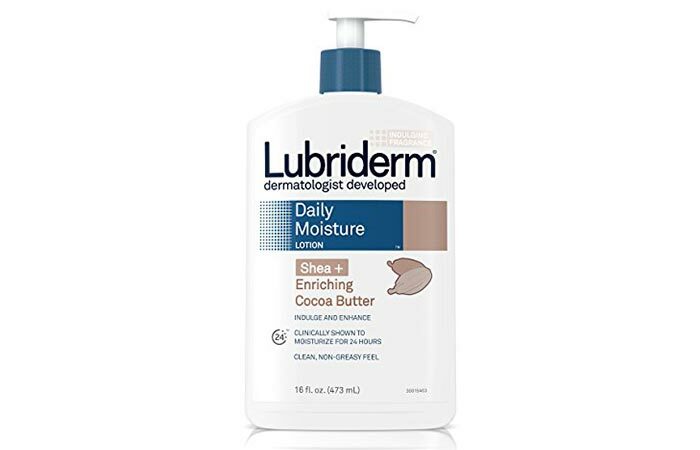 The cocoa butter forms the base; and it contains ingredients like wheat germ, olive, and grapeseed oils that helpsoothe, soften, and moisturize itchy skin. Get a bottle of this forwinter, and you are practically sorted. Works great when used on moist skin. Spreads easily and gets absorbed quickly. Another thing I forgot to mention is that I used to take showers with really hot water, which turned out to be one of the worst things you can do to if you have dry skin. Stick to lukewarm water. Drink a lot of water and stay hydrated; otherwise, your skin will start to dry out from within. Did I miss your favorite drugstore moisturizers for dry skin? Do you want to recommend any other brand that you swear by? Leave a comment in the section below.